I hope I have convinced you in part 1 of this series that a logo is an invaluable addition to your marketing repertoire. In this post, I explain how to use that logo to create a button for your Blogger website. For those unfamiliar with them, buttons are a way for your readers to "grab" your logo and copy it to their own sites. When their readers click the image, they are redirected to your website. It is a visual replacement of a www.blablabla.com link to your page. 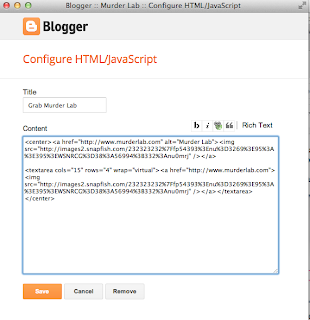 Creating a button on blogger is easy. 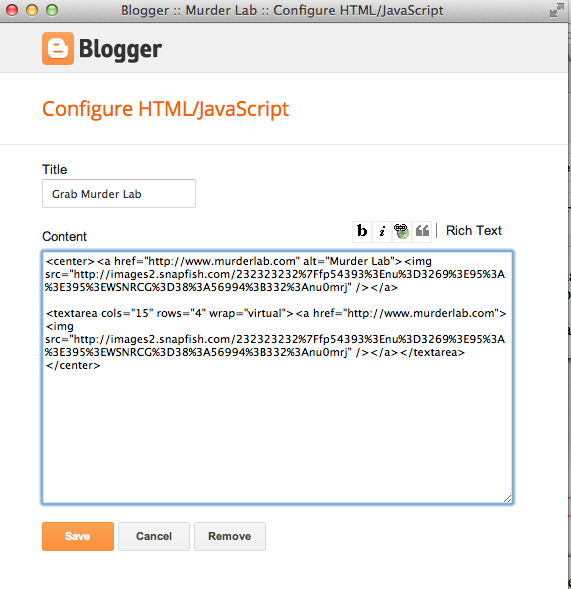 On the upper right hand corner of your blog is the "Design" link, which you enter to make any changes to your site. Start by clicking there. Now click "Layout" on the left hand side of the new screen, to be redirected to a page that has all of your various blog elements arranged. Click "Add a Gadget." 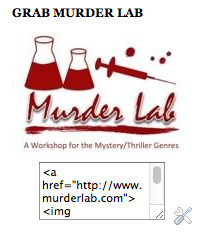 First, in the two places above where I have "http://www.murderlab.com", replace the text between the quotation marks with your own website. You must include the http://. This will direct the button to your page. You're half done. That's it! Click "Save" and arrange your layout how you want it. Then click "Save Arrangement" and you should have a brand new button for the stealing on your site.